This highly maneuverable, two-speed, fold-up burnisher makes it easier than ever before to bring a super high-gloss shine to any hard floor surface! 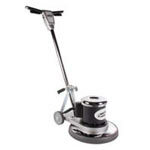 The powerful and smooth-running 1.5 HP, DC rectified motor and adjustable 1000 or 2000 RPM pad speeds produce a spectacular wet-look finish in record time. With its fold-down handle and compact design, this dual speed burnisher is also the ultimate in portability and storage. It offers superior maneuverability in small, confined areas such as medical exam rooms, convenience stores, small classrooms, and other tight areas. For more options take a look at our complete line of electric floor burnisher buffers including a machine with all of the same great features as this one but with lower revolutions per minute - the Hawk 750 & 1500 RPM polisher.